[04-Dec-2018 01:06:18 Europe/Zagreb] PHP Fatal error: Call to undefined function add_action() in /home/ikovic/public_html/ivor-kovic.com/wp-content/themes/apex/inc/customizer.php on line 4 android Archives - Ivor Kovic M.D. You are viewing the android tag archive. Ivor Medical is a company which I have started in order to develop my invention for cardiopulmonary resuscitation (CPR). Some of you will remember my talk from Mobile Monday Amsterdam event earlier this year, where for the first time I have presented my invention which is intended to relieve rescuers’ fatigue, as well as provide feedback during CPR. After being awarded with several prestigious awards from international innovation fairs, I have decided to seriously pursue the development of my invention into a product available for market. So far, my company has developed a mobile application for CPR feedback called CPR PRO, which is already available in the iTunes store, and will soon also be available for Android phones. My cradle for holding a mobile phone during CPR is also in its final stage of development, and I expect it to be available for sale by the end of this year. 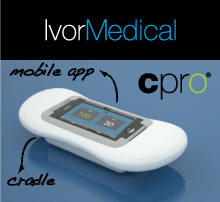 Go ahead and visit Ivor Medical website to learn more. It goes without saying that your suggestions are always welcomed.